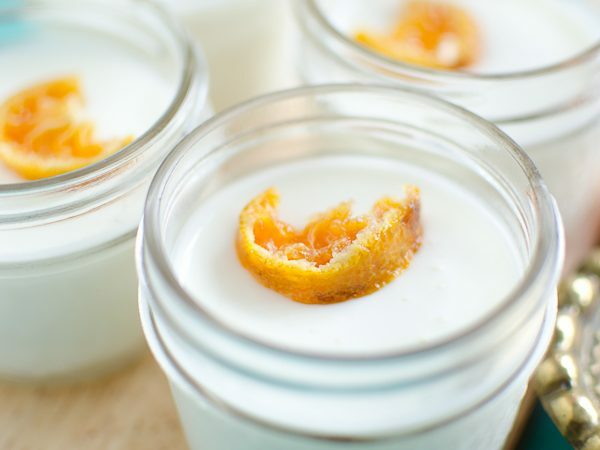 This beautiful panna cotta is scented with orange blossom water and topped with easy to make candied mandarins. You will love it! Stir in the sugar and heat gently over low heat until the sugar and gelatine have completely dissolved. DO NOT BOIL. Remove from heat and whisk in the whipping cream and orange blossom water. (Start by adding 3/4 teaspoon of the orange blossom water and increase it if you would like the flavour to be stronger.) Place in fridge for 30 minutes, or until cool to the touch. Once cool, whisk the panna cotta once more and then pour into little mason jars, cups or whatever cute little jars you plan on serving it in. Cover and refrigerate until set, about 4 hours. Wash them well (do not remove the peel). Cut off the ends and then slice into 3 circles. Cut each circle in half and add to a small bowl. Sprinkle with sugar and toss gently to coat. Place on the prepared baking sheet and bake for about 20 minutes, flipping halfway through. You want them to still be chewy and not completely dried out. Serve on top of panna cotta.